Graphite, since the first discovery in the 1500's, its characteristics have been found to be very useful for society in many different ways. Understanding the physical and chemical properties of graphite has led to discoveries of many uses of graphite. The use of graphite is dependent upon the physical state of the graphite. Graphite that is soft and smooth (used in lubricants) can be used differently than graphite that is hard and rough (used in pencils). Although there are countless uses for graphite, some uses stand out more than others. The use of graphite in pencils, lubricants, and molds are defiantly some of the more popular and impacting uses. The structure of carbon in graphite. The properties of a compound consist of both it's physical properties as well as its chemical properties. Main physical properties include that the mineral graphite is generally black to steel gray in color and it is odorless. Graphite and also have multiple textures. One known texture is that it is very soft and greasy. Graphite can also be broken into powder that leave steaks of black when touched or rubbed up against an object. The structure of graphite is crystalline, meaning made of or formed like a crystal, but perfect crystals are rarely found. Graphite's main ingredient are carbon atoms, which have hexagonal arranged structure. This is what gives graphite its hexagonal shaped crystals. Multiple layers of these hexagonal carbons are stacked together and forms a giant covalent structure which is held together by weak covalent forces. Each layer of the arrangement of carbons is about 2.5 times the distance between the each atom within its layer. Three electrons from each carbon atom form bonds with three electrons of close neighbors while the fourth electron becomes delocalized over the layer of atoms. This delocalized electron is not associated with any other electron directly, but rather it is free to wander throughout the layer. Additional physical properties of graphite include that its melting point is very high, similar to a diamond. To melt graphite, you can not only break one layer of carbons, but have to break the bonding throughout the entire structure. The density of graphite is also quite low, due to the amount of "wasted" space between each of its layers. Graphite also has the ability to conduct electricity because of the free moving delocalized electrons throughout the layers. When connected into a circuit, electrons of a layer will fall off and replace new ones at another layer. Graphite is also insoluble in water as well as in other solvents. Some chemical properties of graphite include that it is chemically inactive to most chemicals and that it burns when heated in oxygen to form carbon dioxide. Graphite gets oxidized to carbon dioxide when it is heated in the presence of concentrated sulfuric acid and potassium dichromate. Graphite is widely used as a refectory material because of its chemical inactiveness and stability at high temperatures. Graphite can be found in many different areas as well as in many different forms, shapes, and sizes. Graphite is formed by carbon when subjected to immense heat and pressure in the Earth's crust and upper mantle. Requirements of 75,000 pounds per square inch and 750 degrees Celsius in temperature are needed to produce graphite. Graphite most often found in today's Earth's surface are shaped as tiny crystals and flakes of graphite. This produced product is often known as "flake graphite." Another form of graphite is created by the metamorphism of coal. Carbon, oxygen, hydrogen, nitrogen, and sulfur are the main organic materials of coal. The heat of the metamorphism destroyed coal's organic molecules and leaves an almost pure carbon material which crystallizes into mineral graphite. The material of this form of graphite is similar to lumps of coal. Large deposits of graphite can also be found in veins. These deposits are mined and generally used for industrial proposes. 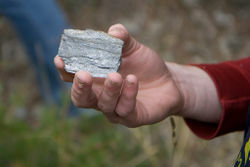 Small amounts of graphite can also be formed by carbon compound reactions in the rock during hydrothermal metamorphism. Mobilized carbon can be deposited in veins in association with hydrothermal minerals. Also, because of graphite's high degree of crystallinity, it makes for a material preferred for many electrical uses. Small amounts of graphite also often occurs as primary minerals in igneous rocks as well as in some iron meteorites. These forms of graphite are without economic importance. Image of a graphite lead pencil. Graphite is an abundant resource on the earth and has many uses. One of the greatest uses of graphite is the use of a lubricant. Because graphite is an extremely soft material, it can be broken into flexible flakes which are able to easily slide over one another, giving graphite's distinctive greasy feel. Since graphite is a solid material, this greasy feel is known as a dry lubricant. Graphite's dry lubricant feature is very important because it can be used wherever a liquid such as oil can not be used. A second main use of graphite is that it is used for the lead of pencils. Graphite can have a texture similar to charcoal except graphite does not burn. This provided the idea of graphite being used as a marker or utensil that left tracings originally on animal skins. Today, graphite is a popular resource in almost all pencils. Other popular uses for graphite include that it can be used as a binder in paints and as various types of writing and drawing instruments. Since graphite can withstand very high heat, it was also used as a mold for cannonballs throughout history. Today, graphite is used for various molds for melted iron. Graphites is also used in nuclear reactors as a neutron moderator to absorb the neutrons and electricity rather than slow them down. Graphite has been made very valuable because of it nuclear energy uses. Another popular form of graphite is its form of graphene. It exists in one atom thick sheets. Its natural thinness makes it useful for many reasons. Because of its large surface area, it can be used as a gas detector since it can set off a tiny current as soon as a gas molecule hits the graphene sheet. The sheets of graphene can also be used in bandages because of its ability to kill bacteria. The most common use for graphene is when used in nanotechnology. It can be used to turn on tiny gadgets because it can make tiny electrical circuits from its thin conductive sheet. After a large graphite deposit discovery in Borrowdale, England in 1564, the existence of graphite became greatly known. Stories say that a person found shiny bits of black substance attached to the roots of a fallen tree. Word of this mysterious find spread and the mineral eventually received the name "plumbago" or, commonly known as "Blackhead." They discovered its ability to leave a mark and realized its writing and drawing importance. Originally, graphite was wrapped with string to be used as a writing utensil, but was later inserted into hollowed out wooden sticks. This was the beginning of wood-cased pencils. In 1795, a French chemist patented a new mixing method process for making graphite pencil leads. The new mixture improved the hardness of the lead to be harder rather than being soft a brittle. The change in firmness also provided more control over writing. When graphite was first discovered, people realized that it resembled coal but it did not burn at all. England took charge of the graphite mining operations and realized that it served as a great cannonball mold. Because of this discovery, the value of graphite dramatically increased over a short time. Graphite soon became a precious commodity. The stealing and trade of stolen graphite soon became a criminal offense and punishable. Graphite pencils originally had to be made by hand. To start the pencil making process, you would have to cut graphite into slabs. then you would have to carve a groove into a small piece of wood for the graphite to fit in. The graphite would then be trimmed to properly fit the hollow wood. The wood was to be carved and shaped by hand with a knife to determine the shape of the pencil (round, oval, square, etc.). Later, a foot-operated tools were invented to shape out the wood and the process of pencil making became less tedious. By the 1840's, pencil making industries were started and continued to improve the the pencils we have today. The carbon structures of diamond and graphite. ↑ 1.0 1.1 1.2 Deshpande, Amruta. Properties of Graphite Buzzle. Web. Published April 27, 2010. ↑ 2.0 2.1 Clark, Jim. The Structure of Graphite Chem Guide. Web. Last-Modified October, 2012. ↑ 3.0 3.1 Graphite Mineral Database Minerals Education Coalition. Web. Accessed November 3, 2016. Unknown Author. ↑ 4.0 4.1 Graphite's Geologic Occurance Geology.com. Web. Accessed November 4, 2016. Unknown Author. ↑ Graphite mindate.org. Web. Accessed November 4, 2016. Unknown Author. ↑ Uses of Graphite University of Waterloo. Web. Published March, 2006. Unknown Author. ↑ Cox, Heather E. et al.Chemistry. Greenville, S.C: Bob Jones University Press, 2009. 127. Print. ↑ Graphite over generations The Human Touch of Chemistry. Web. Accessed November 13, 2016. Unknown Author. ↑ Early Graphite Discoveries Pencils.com. Web. Accessed November 13, 2016. Unknown Author. ↑ History of the Pencil University of Waterloo. Web. Published March, 2006. Unknown Author. This page was last modified on 7 December 2016, at 16:08.